The identity of Beychevelle is based on a legend. At the beginning of the 17th century, the Chateau became the property of the First Duke of Epernon. He was so powerful that ships sailing the Gironde had to lower their sails up until the castle as a sign of respect and allegiance to the Duke. It was during this time that the domaine acquired its emblem, a griffon-bowed ship with its Gascon-derived named “Baisse voile” that would later become Beychevelle. A superb property with beautiful gardens, Chateau Beychevelle produces one of the prestigious wines from the Saint-Julien appellation, which is located on the Left Bank of the Bordeaux region. More radiant than ever, the estate’s new vat house designed by architect Arnaud Boulain is at the forefront of innovation. Among the 250-hectare property, Chateau Beychevelle oversees 90 hectares of vines that grow the typical Medoc varieties: 52% Cabernet Sauvignon, 40% Merlot, 5% Cabernet Franc and 3% Petit Verdot. The uniqueness of Beychevelle’s terroir is due to its magnificent Garonne gravel outcrops and its prime location in the immediate vicinity of the Gironde, which helps regulate and protect against the climate. 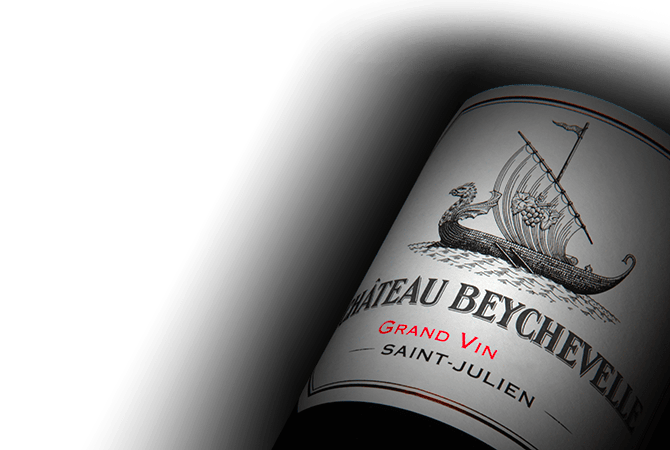 As exceptional wines, the style of Chateau Beychevelle is typified by its consistent, excellent quality. Powerful, fleshy and structured, they express the elegance and finesse of the exceptional terroir of Saint-Julien. Made for cellaring, the wines of Chateau Beychevelle evolve superbly over the years.